Kelly Logsdon Rush is Champions School of Real Estate Teacher of the Year! Maybe you went to Yale or SMU for your undergrad degree, but if you have a real estate license and you got it in Dallas, chances are you went to Champions School of Real Estate on Mapleshade in Plano. That’s where I went, that’s where Kari Schlegel Kloewer went, that’s where everyone goes to get a license. Even Eleanor Mowery Sheets was there last June. I don’t know about you, but my favorite teacher was Kelly Logsdon Rush. (The guy who taught real estate law was number two.) Kelly was fun, vivacious, and boy did she know her stuff. I actually kept my iphone in my purse during her class — she was more interesting than email! The letter went on to say that the evaluations came from season agents as well as the newbies. Congratulations, Kelly. Kelly is an Ebby Halliday agent at Ebby’s Little White House. I’ve asked her to begin contributing to CandysDirt.com not because I was teacher’s pet or anything, but because I think we may need to hear from The Teacher once in awhile. And it would be a blast to re-live class right here on this blog! Hey Diddle Diddle, The Cat and the Fiddle, Kari Kloewer’s Having a Baby Soon! 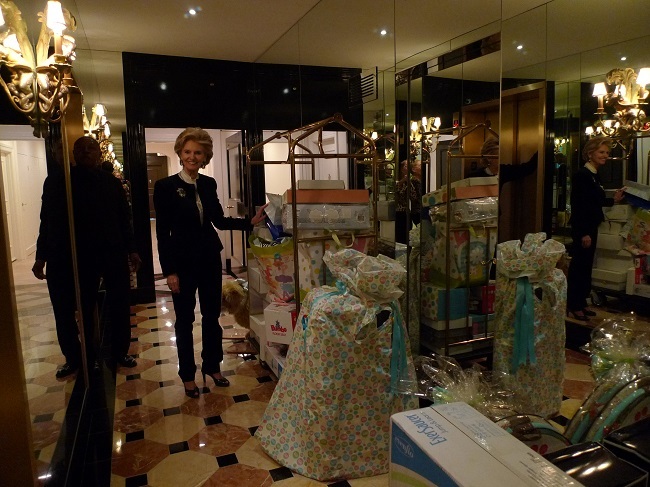 Last Saturday was Celebrate Baby Day at Allie Beth Allman’s fabulous Crestpark penthouse that, quite honestly, rivals Tim Headington’s. I mean, does Tim (or the new owner) have a greenhouse or a pond on HIS terrace? 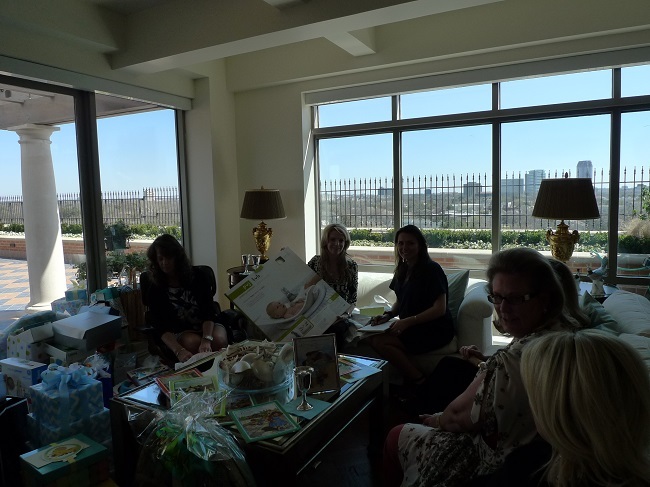 The occasion was a joyous baby shower for agent extraordinaire Kari Schlegel Kloewer who is expecting a baby boy this spring, though from looking at her you would never, ever know it. Kari’s sister Kim Schlegel Whitman is also expecting her second child, and mom Myrna is gearing up for three grandchildren and many, many hours of babysitting! Hey Diddle Diddle, The Cat and the Fiddle, Kari Kloewer's Having a Baby Soon! Newlywed and recent Cox School of Business grad Kari Schlegel Kloewer has a lot going on. A lot! Although still in her 20’s, Kari is already an accomplished Realtor. She and The Perry Allegra Schlegel Real Estate Group closed over $38 million in luxury home sales this year and she was named Best of 2012 Realtors by D Magazine. Consistently one of the company’s top producers, she has worked her way up to Senior Vice President of one of legendary agencies in Dallas, Allie Beth Allman & Associates which just achieved its first $1 Billion (yes, with a “B”) year for a single office. In fact, we are panting just trying to keep up with Kari. CD: Where are you from? Kari: I was born in London, Ontario Canada, but my family moved down to Dallas when I was about a year old. I consider myself a Canadian-Dallasite. Kari: I graduated from SMU and got a marketing job in the corporate world. Two of my friends became Realtors. We’d go to lunch and I’d be so envious because they seemed like they were having such a fun time. I’ve always loved real estate. I’d go to open houses for fun on the weekends. After a couple of years of pining, I made the switch and joined Allie Beth Allman. I’m much happier now and I’m thrilled to have Allie Beth Allman as a mentor. I’ve learned so much from her and feel incredibly lucky. CD: You just got your MBA from SMU in May. Why go back to school? Kari: My Bachelor’s was in Business Administration – with an emphasis on marketing – and I felt that getting an MBA would make me even more useful to my clients. I learned a lot about real estate investing and marketing that will help me sell houses as well as market myself and my group. Kari: I’ve lived at the W Dallas Victory Residences for the past five years or so and I love it! 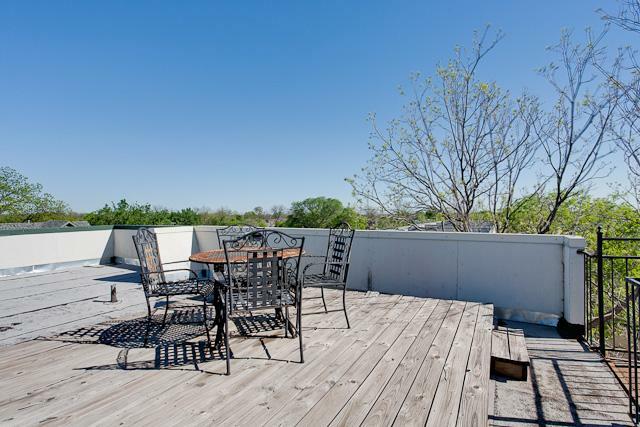 I’m close to everything, I have a great urban life and I can walk to restaurants, the American Airlines center and all the arts and entertainment downtown. The city has changed so much in the past five years. I wish I’d taken “before” and “after” pictures. I’ve seen the Perot Museum of Nature & Science and Margaret Hunt Hill Bridge spring up in front of my eyes from my balcony. I recently posted some pictures on my blog of the current views from my balcony. CD: And you drive a… let me guess, Mercedes Benz??? Kari: How did you know?!? (laughs) I guess it is the ultimate Realtor car because it is so comfortable for driving clients to look at houses. I have a Mercedes CLS 550. 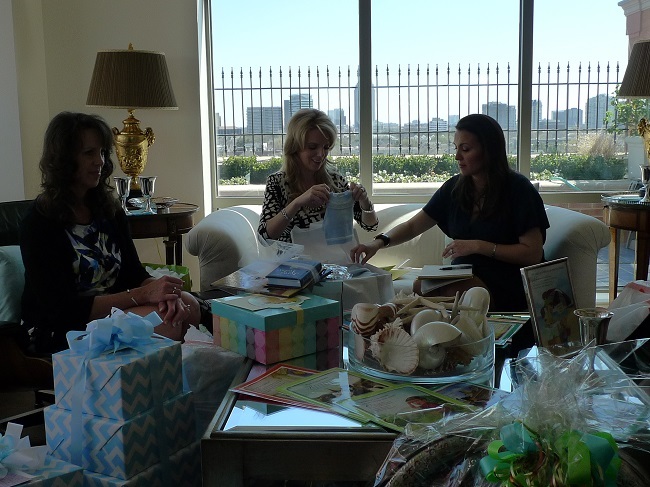 Kari: I grew up in Preston Hollow and love it. The parks, the lovely old trees, the shopping, the beautiful houses and the excellent schools make this area my favorite for selling. I love my high rise life at the W but would definitely consider Preston Hollow or the Park Cities if we wanted a house in the future. 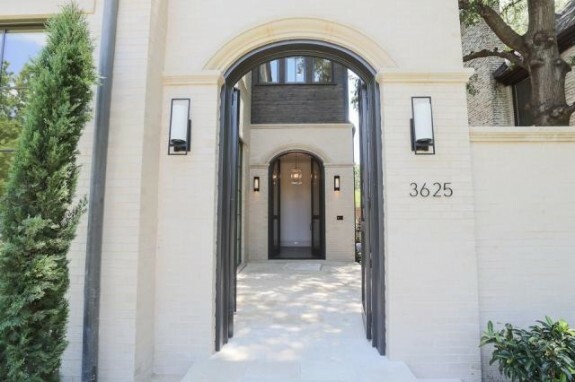 Kari: In 2011 Allie Beth and I represented the buyers for a house that was listed for $9 million. Just this year I represented the sellers on a $7 million home. It was very challenging and interesting. Selling a luxury home in that price range requires careful marketing and I learned a lot from the experience. Kari: About a week or so. Kari: My team closed about $35 million in 2011 and have sold $38 million in 2012 so far. CD: What have you learned about selling that makes you so successful? Kari: As a new realtor, you are trained to think of selling real estate as a transaction. There’s a lot of focus on getting the details and paperwork right and understanding how real estate works. What I keep in mind, however, is that to the customer, this is an emotional experience, not just a financial transaction. They may be buying their first home as a couple or selling 30 years of memories. Their feelings need to be honored and celebrated throughout the process. To me, real estate is about relationships and having fun. While I love looking at houses, it is the relationships with people that I’ve developed along the way that really make this a satisfying career. Some of my close friends today were once clients. Kari: It is hard to imagine doing anything else, I love real estate. It has so much variety and daily surprises it is a very exciting career. If I really had to change for some reason, I guess I’d be a personal shopper – there would be very little learning curve! Kari: Not yet. My family has a vacation home in Canada and we love to go there every summer as a group. My husband Troy proposed to me on the beach up there. When we decide to buy our own second home, it will probably be in California. I love the weather and laid back lifestyle. CandysDirt will be the first to know! Do you have your coffee yet? Good, because this house is like a beignet from Cafe Du Monde. This house, it just makes me want to say “Ahhhhhhhh!” It’s 3625 Bryn Mawr, marketed by the gorgeous and talented Kari Schlegel Kloewer of Allie Beth Allman & Associates, and it was just completed by the experts at Tatum Brown Custom Homes. If you want high-end finish-out and tons of extras, Tatum Brown is the go-to builder. In fact, this company is on our short list of Hot Builders! Just from glancing around, you can see why we love Tatum Brown, too! I mean, look at the thoughtful entrance that keeps with the elegant and modern Santa Barbara style. It’s beautiful, but not too ostentatious. This home, desiged by Stocker, Hoestry, Montenegro Architects, is like a hot brunette in a little black dress! 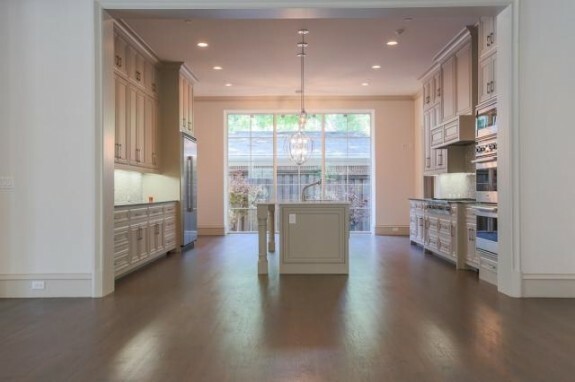 This University Park home has all of the upgrades and add-ons you want inside its 6,651 square feet. 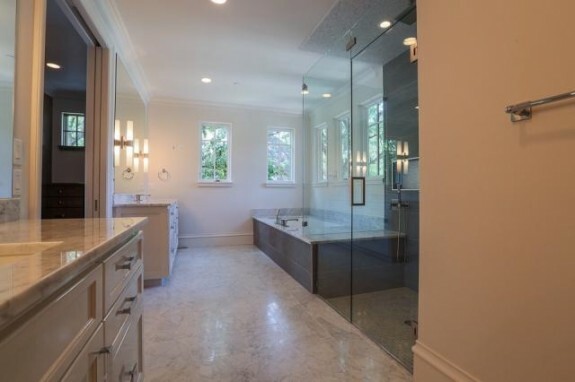 You get impeccable hardwood floors, floor-to-ceiling windows, luxury light fixtures with some really killer chandeliers, marble, granite, and a wet bar. WHEW. That’s a lot! 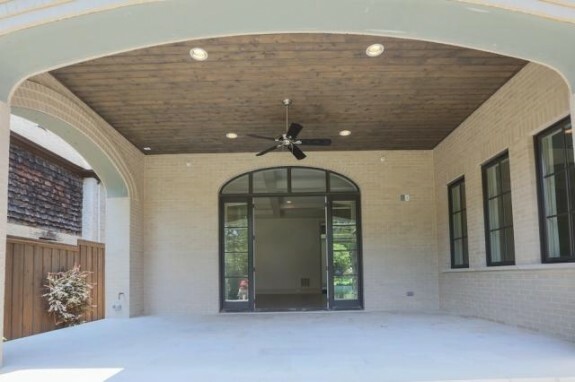 There are five bedrooms and five and a half bathrooms, along with three living spaces, two dining rooms, a game or media room, a mud room, and some of the best schools in the state. I love a kitchen that is open and accessible, and this one is just that! The huge island is perfect for entertaining. Imagine the marble expanse covered in cheese boards and fruit plates, with a bucket of chilled champagne and orange juice just waiting for brunch guests to arrive! Of course, there’s tons of stainless in the kitchen, and there’s some really beautiful tile in the backsplash, too! 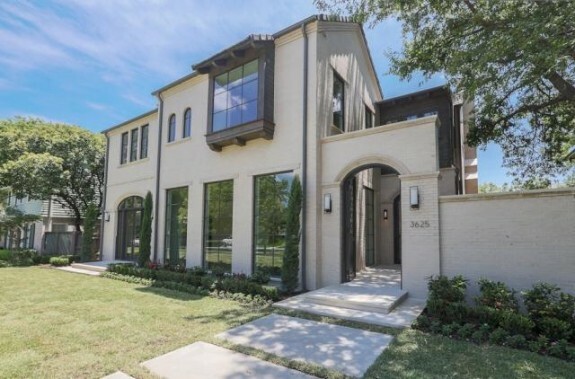 From what I hear, it’s almost impossible to buy new construction in the Park Cities without buying a teardown first, razing the structure, and starting fresh from there. 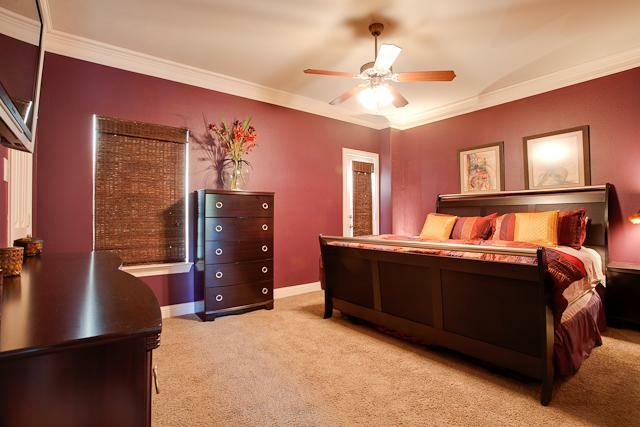 If you get exhausted just thinking about all that work, well, this lovely home is for you! It’s on the market at a great price, too. 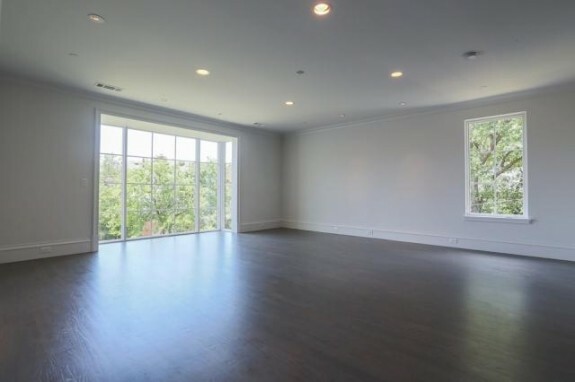 I think $2.95 million is a fair asking for such a spacious, modern, and well-thought-out home. What do you think? 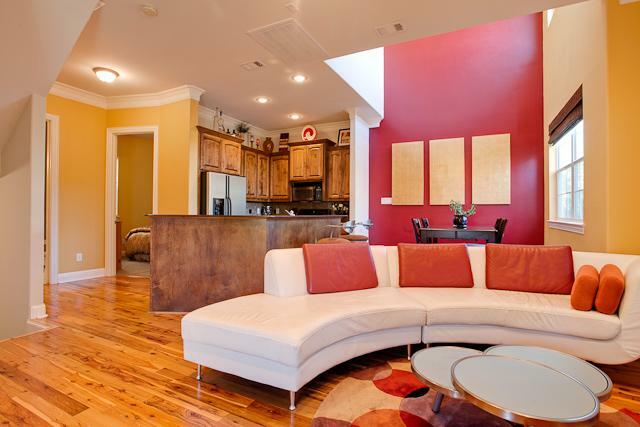 Kari Schlegel is listing her hubby’s cute condo over at 1719 Mary Street, in East dallas near Ross, and is getting ready to reduce the price. (Shh. I didn’t tell you.) This is an end unit, which she says has more windows and light than the others. Two bedrooms, two baths, three stories, built in 2003. HOA’s are only $75 a month — that’s a far cry from the W where Kari and Troy live now! This condo really has it all! The sleek hardwood floors are brand new. 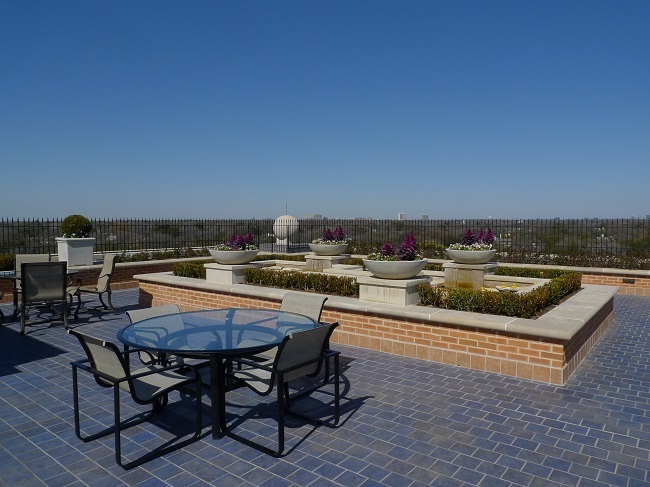 The rooftop deck provides views of downtown Dallas. All new A/C unit kept the place super cool during our heat wave. In the kitchen, which is admittedly a bachelor’s pad, but a tasteful bachelor’s pad, there are granite countertops looking over the open living, kitchen, and dining floorplan. There is also a large space for study, office, or sitting area off of a great third floor master bedroom with loft overlooking the downstairs dining area. Sold furnished. Great investment: a unit with a little, no make that a lot, of romance behind it…$224,000.